Caring For Newborn Kitten. Mother Cat, 5 Kittens, a Kitten Death. Not quite death of a pet, but still a sense of loss. Cat Blogs, Diary Blogs, Blog Journals. Mother Cat, 5 Kittens, a Kitten Death. Not quite death of a pet, but still a sense of loss. Cat Blogs, Diary Blogs, Blog Journals. For the past week, there's been a very pregnant barn cat in my bathroom - plus more barn kittens in my spare bathroom. 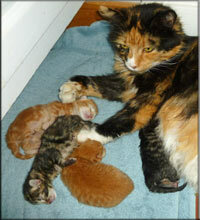 Yesterday the mother cat began to give birth. First, 2 kittens. I was nearby, in the next room. I heard nothing, went in, and there they were, sucking. A couple of hours later, there were 2 more, one with the umbilical cord still attached, the placenta still inside the mother. The newborn kitten was already sucking, very alive. It was at least half an hour before the placenta came out and the mother cut the cord. Night came. All seemed well. 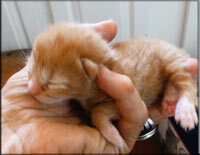 This morning, there was a dead newborn - a fifth baby kitten - a few feet from the mother, close to the kitty litter box. Still wet. Cool. Limp. I held it in my hands, felt it warming. Was it still alive, the way people go into hypothermia but are still alive? For now, I'm keeping it warm - but I think it's too late. I'm not grieving for it - but I feel a sense of loss. I was trying to protect. Could not protect, well enough, this little kitten. I know there's no cat shortage in the world. In fact, that's why I've taken on getting the neighbor's female cats spayed. Too many cats. And so many deaths. The mother cat is restless now. Is there another kitten in her, needing to be born? It's daytime. I will be there, every hour or so, to see if there's another kitten, and to make sure it is suckled. As for the mother cat, I hope she's okay. She's had many litters, and so is very likely to get through this well. I was told me was an old cat - maybe 3 or 4. Very young for a house cat. Not young for a barn cat. She will be spayed when the kittens are 8 weeks old. Spayed and returned to the barn. She's had all the cream-milk (about 6%) she wants over the past week, as well as good quality cat food. I will make sure she keeps having all she could want - for her sake, and also to make it more likely that she accepts all her kittens. Caring for a newborn kitten. So easy - just let the mother do it. And yet sometimes that's not enough. I remember, years ago, a newborn who was injured and could not be near the mother for a couple of days. I learned from the vet how to massage it, so it would urinate and defecate - because otherwise it would have died. Something new this morning. A kitten dead because, for a few hours, the mother cat walked away. She must have heard it mewling. What did it say inside her? Too much, this is too much? Maybe that's how she survived in the barn, instinctively knowing her limits. But this time the limits have changed. There's more. I heard mewling, just about at dawn, and went to check. All seemed fine. The mother cat was lying with all 4 kittens. I heard nothing from a few feet away. All was quiet. I left, went back to sleep. And when I came back, long after sunrise, it was too late. Or maybe the last kitten was born dead, and what I heard was the mewling of the living newborns when the mother went away for a few minutes. By the time I went to look, she was with them so all was quiet. I don't know, can't know. Anyway, complex stuff. Life and death. Caring. Trying my best. that links with emotion and motivation. but still the death of a kitten. of my caring for cats. I would have loved to be able to protect? Definitely more diary blogs, blog journals. An ongoing adventure in life. Nope. An exploration of universal ethics.